With a break in the weather, Public Works crews are focusing their efforts on filling potholes on Village maintained streets. Two teams, one on the north side of town and one on the south end, are systematically working on streets according to snow plow routes. Pothole filling activity will continue to be ongoing when teams are not in snow operations and weather and temperatures for filling are favorable. Residents may report potholes by calling Public Works at 630-434-5460. The Village makes every effort to fill potholes as they are discovered or reported. When it is cold or wet outside, the material used to patch potholes doesn't adhere as well to the surrounding pavement. Pothole repairs made under these conditions are temporary and may not last as long as compared to when conditions are ideal. This may explain why it seems that the same pothole never gets fixed, when in reality it has been repaired several times. 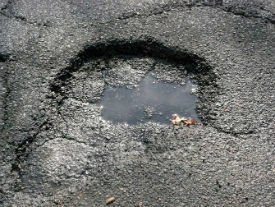 In addition to ongoing pothole filling, the Village will soon seek bids for the first time for a Spring Patching contract. Similar to the Fall Patching contract, this type of work is more permanent in nature. Pending bid notification and approval, the Spring Patching contract will begin in late April or early May with streets to be announced.